The McKee's 37 Wayne Carini Chasing Gloss Bucket Kit is an all-inclusive kit that will keep your vehicle looking its glossiest! This incredible combo features everything you need to find the gloss, and keep it. Start with McKee's 37 Detailing Clay and Universal Clay Lubricant to nab and gloss-hindering embedded contaminants. The Wayne Carini Bucket with Grit Guard and Gamma Seal Lid makes it safer to rinse away surface contaminants with McKee's 37 Xtreme Foam Formula. Then, clean wheels with McKee's 37 Foaming Wheel Cleaner Gel. Seal out Contaminants with McKee's 37 High Def Paint Sealant and boost gloss with High Gloss Detail Spray. We’ve even included McKee's 37 Krystal vision Glass Cleaner so you’ll have the cleanest glass on the block, too! The McKee's 37 Wayne Carini Chasing Gloss Combo makes achieving a smooth, glossy shine easier than ever! The Wayne Carini 5 Gallon Wash Bucket with Grit Guard and Gamma Seal Lid offers three essential accessories that every person needs to wash their car. This perfect trio includes a rugged 5-gallon wash bucket emblazoned with a stylish Wayne Carini logo that shows your level of commitment to car care. This durable bucket is guaranteed not to crack use after use, and includes a Grit Guard that locks dirt and debris in the bottom of the bucket to prevent wash-induced swirl marks. The Gamma Seal Lid is perfect for transporting your favorite wash mixture to car shows and meet ups, making this bucket a must-have for your garage! McKee's 37 Universal Clay Lubricant is a high lubricity formula that allows gritty particles removed from the clearcoat to glide just above the surface of the paint. It thoroughly wets the paint surface to enable you to rub the clay bar effortlessly. The lubricant spray contains no gloss agents so you can see the true results of the clay bar. When you are finished claying an area, use McKee's 37 Universal Clay Lubricant to remove any clay residue. It can also be used to remove fingerprints and dust in between details. The water-based formula will not degrade synthetic or natural clay, and overspray will not affect glass, metal, plastic, or rubber. Use it with McKee's 37 Universal Detailing Clay to create a smooth, silky finish that is completely clean. McKee's 37 Foaming Wheel Cleaner Gel "bleeds" red as it removes embedded brake-dust particles. McKee's 37 High Gloss Detail Spray enhances gloss and extends protection in just a few minutes! The Green Monster Wash Mitt has everything you need in a wash mitt: it’s super soft and it holds a lot of soapy water! Thousands of soft strands of fabric cover the outside of the mitt to trap dirt and pull it away from paint. 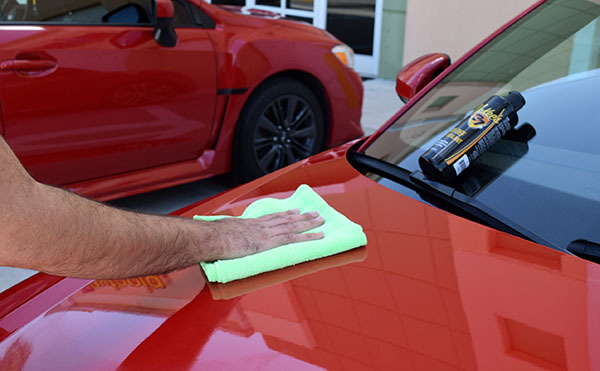 This prevents debris from being rubbed back across your paint causing scratched and swirls. For comfort and ease of use, the Green Monster Wash Mitt features an elastic wrist band to keep it in place while you wash so you won’t accidentally drop it. Total retail value of $155.92. You save $55.93! Awesome products! 5 These products are like none other when it comes to car care. My car is looks brand new after using these products!